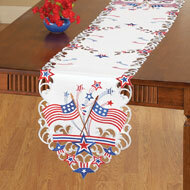 Americana Stars Patriotic Table Runner from Collections Etc. 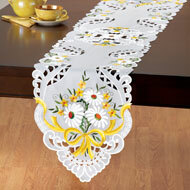 Scalloped edge runner features a galaxy of red, white & blue embroidered stars. Polyester. Machine wash. Imported. 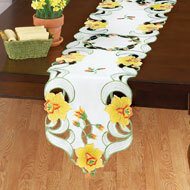 Measures 55 1/2"L x 17"W.
I LOVE THESE TABLE RUNNERS! I can use this for all 3 summer holidays. - Mimi, Frankfort, IL. I am using this to go with my patriotic themed décor that I use Memorial Day through July 4th. - Kevin, Ames IA. looks very nice on table - tee, Duarte Calif. I love this runner. Is better than I expected for the price. - Cash's Mommy, Littleton, Co. This is the best bargin ever! looks great on a table. Love it - jani, Orangevale, CA. 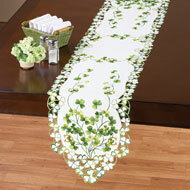 I love the patriotic table runner. I'm using it on my kitchen table and plan to use it for Memorial Day & 4th of July. - Granny3, Mountains of N.C. This is a perfect way to show how much you love your Country. My Family goes all out to decorate our home for the Fourth of July inside and out and our place is really lit up. Collections ETC. has great Holiday decor to choose from and we can't wait to get started for all our Holidays. We live in a Senior gated community and all the residents look forward to seeing our displays each year. We don't do this just for family . Thanks for all your great products you have to offer , We truly love to share with others. - The Seniors, Atwater,CA. It's beautiful on my large oak table. I also order the candle ring with same color of flowers to go with it. - Grandma in Swanton, Swanton OH. I was very pleased when I received this item. It is very colorful and well made. - Collections catalog buyer, Ct.